Kikusui Sake, originally uploaded by truublooo*. "You are with the woman of your dreams, at a Japanese yakitori bar. The hot Asian waitress asked what would you like to go with with your stunning kushiyaki selection. Only your date is hotter than the waitress. The sake selection mystifies you. House sake and Sapporo would usually do, but not tonight. She is the woman of your dreams...If Kikusui sake is on the menu, confidently ask the hot waitress for one, like you have a thousand of times before, even if it will be your first time. 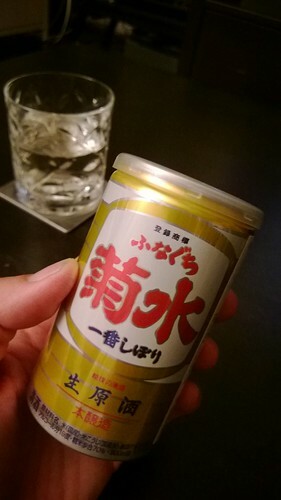 Tell you date, you think this sake in a can will be a good starter..."